Rabbit anti-Hemagglutinin (NT) protein polyclonal antibody was raised against a synthetic peptide corresponding to 15 amino acids at the amino terminus of the Hemagglutinin protein (Genbank accession no. AAT76166). Efforts were made to use relatively conserved regions of the viral sequence as the antigen. The antibody only recognizes the cleaved subunit not the full-length H5. Synthetic peptide corresponding to 15 amino acids near the N terminus of the Hemagglutinin protein. (Peptide available as ab39772). Our Abpromise guarantee covers the use of ab21297 in the following tested applications. WB Use at an assay dependent concentration. Predicted molecular weight: 64 kDa.Can be blocked with Chicken Avian Influenza A Hemagglutinin peptide (ab39772). Influenza A virus is a major public health threat, killing more than 30,000 people per year in the USA. Novel influenza virus strains caused by genetic drift and viral recombination emerge periodically to which humans have little or no immunity, resulting in devastating pandemics. Influenza A can exist in a variety of animals; however it is in birds that all subtypes can be found. These subtypes are classified based on the combination of the virus coat glycoproteins hemagglutinin (HA) and neuraminidase (NA) subtypes. HA interacts with cell surface proteins containing oligosaccharides with terminal sialyl residues. Virus isolated from a human infected with the H5N1 strain in 1997 could bind to oligosaccharides from human as well as avian sources, indicating its species-jumping ability. 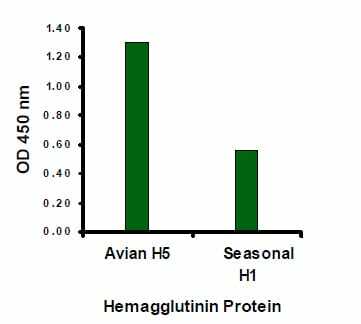 H5N1 HA Antibody (ab21297 at 1 µg/ml) specifically recognizes Avian Influenza A (H5N1), but not seasonal influenza A (H1N1), recombinant Hemagglutinin protein in ELISA. Publishing research using ab21297? Please let us know so that we can cite the reference in this datasheet. ab21297 and ab21292 are ab to avian influenza hemagglutinin protein, the former is targeting the N terminus and the later targeting the middle sequence. I would like to know whether these two sites fall into the different fragment of hemagglutinin after trypsin cleavage. May I have the antigen peptide sequences for these two ab? In your email below (26/08/06) you asked me for feedback about your product. I have given my comments and would like to find out your suggestions about how your antibody could be used, because it clearly doesn't work with our standard protocol. Our antigen is a recombinant A/VietNam/1194/04 and we tried to use the antibody on a monolayer of cells that were either infected or uninfected (see attached data file). Thank you very much for the opportunity to give you feedback regarding your antibodies. At the time I ordered two anti-Influenza A Heamagglutinin(H5N1)polyclonal antibodies (ab21297 and 21292)and both don't work at all in our assay. (data attached) Not only get I no/low signal with your product - it also seems that I get an immense background as well. Meanwhile another member of my group has ordered an antibody (anti-Influenza A Nucleoprotein; ab2285) from your company that also doesn't work (gives the same kind of results as in my experiments). We have received anti- N protein antibodies from several other companies that do work well in ELISA format and I have found that your products are unfit for the advertised purpose. Thank you for your message and your valuable feedback which has now been passed on to me in the Technical Support department. I am very sorry to hear you have had problems obtaining satisfactory results using these antibodies. Often it is possible to make suggestions that help resolve problems. We will happily offer technical support and in the event that a product is not functioning in the applications cited on the product data sheet (and the problem has been reported within 90 days of purchase), and if it appears that the antibody is at fault, a credit note/refund will be offered. If you would like some technical support I enclose a link to our questionnaires which will help you put your protocol information together very easily so we can look into the details of the experiment and provide some help. Although ab21297 and ab21292 are used in ELISA, ab2285 can be used in several applications. I have therefore provided links to each type of application so you can choose the correct one to fill out for each antibody. https://www.abcam.com/index.html?section=elisa&pageconfig=technical&mode=questionaire https://www.abcam.com/index.html?section=western&pageconfig=technical&mode=questionaire https://www.abcam.com/index.html?section=ihc&pageconfig=technical&mode=questionaire https://www.abcam.com/index.html?section=ip&pageconfig=technical&mode=questionaire Thank you for your time. I look forward to receiving the completed questionnaires. Thank you for your enquiry. I have been in touch with the source of this antibody and I can tell you that unfortunately the immunogen sequence is proprietary. However, I can tell you that in their opinion the antibody should not cross-react to other Hemagglutinins. Please let me know if you have any more questions. Would it be possible to know the sequence of the peptide this antibody was raised to? Thank you for your enquiry. Unfortunately, the originator of the antibody will not disclose this information. The most specific information I can give you is what is listed on our datasheet, that the immunogen was selected from between residues 100-150 of Genbank accession number AAT76166. I am sorry I could not be more helpful. Please do not hesitate to contact us again if you need anything further. Thank you for your enquiry. I have performed an alignment of the immunogen sequence with accession numbers AAW80717, AAT39066, and AAA43083. I can tell you that the immunogen was selected from a conserved region of the sequence and shows the following sequence similarity: AAW80717: *************** (100% homology) AAT39066: *************** (100% homology) AAA43083: *************** (100% homology) Please let me know if you have any more questions. I'd like to determine if ab21297 will bind my H5 isolate. Can you give me a Genebank Assession no. to compare with? I understand the peptide used to generate this antibody is from amino acid 100 - 150. Thank you for your enquiry. Unfortunately I cannot provide you with details of the accession number that was used for the design of the immunogen for this antibody. However, I can perform an alignment of your H5 amino acid sequence with the immunogen sequence and provide you with details of the degree of sequence similarity. If you would like me to do this please e-mail me the accession number of your H5 sequence. I look forward to hearing from you. Could you tell me the exact immunogen sequence for these antibodies? Thank you for your enquiry. I can not provide you with the exact sequence used, but it is 14 amino acids within residues 100-150 for ab21297 and within residues 300-350 for catalog number ab21292. Please let me know if you have any more questions. Does the ab21297 antibody cross react with non-H5N1 hemagglutinin protein? Thanks!! Thank you for your enquiry. Unfortunately I do not have details of any cross-reactivity by this antiserum against non-H5N1 hemagglutinin proteins. I have blasted the peptide sequence of the 15 N-terminal residues: MERIVIALAIISIVK derived from the EXPASY database: http://us.expasy.org/uniprot/Q7TEA9 and there are no results suggesting that this sera was raised using a specific immunogen. I am sorry I cannot be of more help. What is the sequence of this peptide? What does the ELISA react with? How do you know if it works? Thank you for your enquiry. Ab21297 was generated using a synthetic peptide corresponding to 15 amino acids at the N-terminus of the Hemagglutinin protein. The exact sequence is proprietary. The antibody's specifity was tested by peptide ELISA in which the antibody was able detect 10 ng of free peptide at 1 µg/ml. 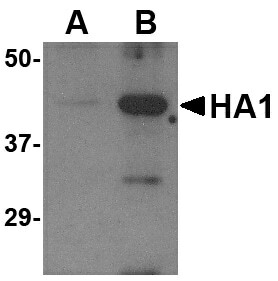 The antibody reacts with Avian Influenza A (H5N1) Hemagglutinin. If you have any additional questions, please contact us again.